"You want to do business in Los Pistoleros turf, then you gotta deal with me." 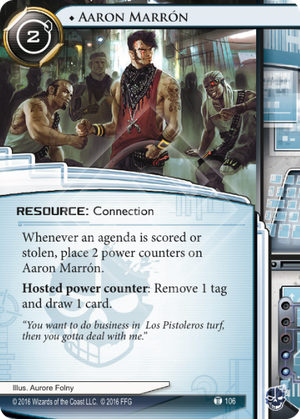 Can the Runner use Aaron Marrón when they have no tags? How about if the stack is empty? As long as either a tag would be removed or a card would be drawn, the ability has the potential to change the game state and thus can be used. If both the stack is empty and the Runner has no tags, then Aaron Marrón cannot possibly change the game state and thus cannot be used. This card looks like it's going to do a lot of work in this tag-heavy meta, but the card draw ability means he'll almost never be a dead draw in other matchups. Great addition to Criminal, along with stuff like On the Lam they're really being given a ton of tools to deal with the increasing amount of tag & kill options for Corp.
Hard counters Breaking News: as soon as they score it you get 2 counters, use them to clear the tags and draw up! Breaking News + Exchange/BOOM! is one of the most potent combos in the game so anything that can straight up deal with that is fantastic. However you won't get counters when 24/7 News Cycle is played, and this doesn't help against the Power Shutdown/Accelerated Diagnostics combo as you don't have a paid ability window to clear tags. For each agenda scored/stolen, you can clear Account Siphon tags for free and draw 2 cards without spending a click, almost like a free Lawyer Up. Clickless draw is very useful vs Jinteki decks that aim to kill you with some combo of Ronin/Bio-Ethics Association/Chairman Hiro. Getting a large amount of counters can be a bit tricky vs decks like IG that don't ever really score out, but the possibility is there. Hard-Hitting News becomes much less taxing. Even with only one or two counters on Aaron you have a much better chance of making it through the huge tempo hit HHN can be. All that aside, even against a non-kill no-tag deck Aaron can still provide you with somewhere between 5-15 clickless card draws across a game for only 2 credits! Criminal is generally considered the weakest runner faction when it comes to card draw so I think Aaron will give them a great boost in speed and survivability. Aaron Marrón is the Beth Kilrain-Chang of Criminals.